Rossi claims his "potential is high" after first day at Sepang. 4 title fighters this season, perhaps? The prototype MotoGP bikes took to the Sepang track for the first time today (or yesterday, if you’re a time difference pedant) since the end of 2012 for the first official test of 2013. It was also the first time that fans, teams, the media and most importantly of all, Rossi himself would get to see how well the Italian can ride an M1 on a dry track. Rossi finished the day in 4th behind pocket-rocket-general-wonderkid Marquez, Lorenzo in second and Pedrosa at the top of the time sheets. During the course of the day, Rossi completed 56 laps with a best time of 2.01.584, under half a second off Pedrosa’s time. While Jorge, who did 58 laps, bested with a 2.01.165, a mere 0.008 from Pedrosa. However, like with yesterday’s CRT test, all times should be taken with a pinch of salt in terms of showing true potential, given the fact that the riders haven’t ridden their bikes in over 2 months and mainly, because it’s the first day of testing. Despite this, we can safely say that Rossi has not ‘lost his touch’ after spending two dismal years on the Ducati. 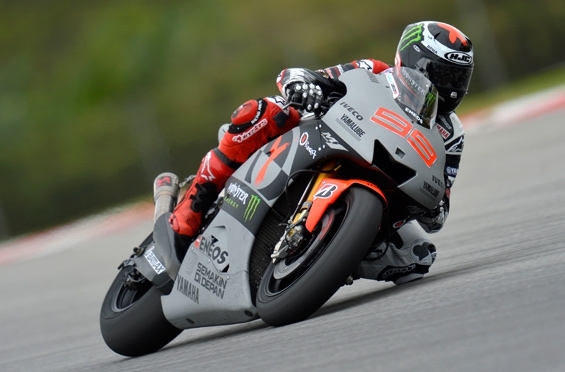 You can view the rest of the times set on day 1 of Sepang here. Previous Previous post: World Supersport Preview: A star-studded class with more potential than ever. Next Next post: Wilks progresses to BSB Stock 1000 with Bournemouth Kawasaki for 2013.